Even with a losing record in the regular season, the Seahawks came into Chicago this weekend with the chance to return to Seattle and host the NFC Championship. Only a few weeks ago, Seattle fans were wondering if this team would win another game. After only two wins, there was talk of this 7-9 Seahawks team going to the Super Bowl. What a crazy year this was. It’s certainly one we won’t forget. All of the Seahawks detractors (and maybe even some local fans) will point to the 35-24 loss against the Bears on the final Sunday of the Hawks’ season and say that this was the team that we all knew and expected to see. But as with other rough losses, the team didn’t back down in the end. Down 28-0 late in the third quarter, it would have been easy for the team to completely roll over and call it a day. Instead, following Coach Pete Carroll and his mantra to “always compete,” Matt Hasselbeck led the team to a respectable finish. In fact, it ended up being Seattle’s only loss all season with a margin of less than two touchdowns. To call it the team’s “best loss” would be admitting there is such a thing as a good loss. After being a huge part of the offense in last week’s game against the Saints, John Carlson went out with a concussion on the first play of Seattle’s second possession. Another big part of the last win, the Hawks running game was non-existent as Marshawn Lynch carried four times for a total of two yards. The team finished with a total of 34 rushing yards. Hasselbeck said there was a tremendous amount of energy surrounding the team with the opportunity to come back home for another playoff game. “As improbable and as unlikely as it may have seemed to a lot of people – I think we really believed and we were really excited,” said Hasselbeck. Even with that energy, the team looked as though they came out flat while allowing the Bears to score on three of their first four possessions. Over that same stretch, Seattle only had one drive where they didn’t go three-and-out. With the way things did set up, fans will only be able to wonder “what if” from this point forward. What if Aaron Curry’s interception that sparked Seattle’s first touchdown would have come in the first quarter instead of the fourth? What would have happened if the Bears failed to link up on a deep touchdown pass that sailed just over the hands of Earl Thomas on third down later in the quarter? There was one play that would have had everyone thinking it was the Seahawks day if it hadn’t come with just over two minutes left in the game. As Bears cornerback Charles Tillman nearly intercepted a short pass to the end zone while falling to the ground, he instead tipped the ball in the air just enough to give Mike Williams the opportunity for a flat-footed snag right before the nose of the ball touched the ground. Down 35-17, there simply wasn’t enough time on the clock to allow for a big shift in momentum. But it didn’t stop the team from continuing to go for it, adding on a third touchdown, and going for a final onside kick. Although things didn’t work out as well as anyone would have hoped in this game, when Seahawks fans take a step back a season many figured to be a “rebuilding year” turned out much better than many expected. With the season the Seahawks were having, it probably would have been a whole lot easier for the team to lose to St. Louis and head on home to get ready for next year. Instead, not only did fans get to see a big home win over a division rival to earn another banner for the rafters, but we got to see the Seahawks take down the defending Super Bowl champions. A loss to the Rams also would have robbed everyone from seeing an amazing run by Marshawn Lynch that has now been coined the “Beast Quake” for the seismic vibrations created by the reaction of the 12th Man. But even with the excitement that surrounded the past few games and the hope toward what the coming years will bring, there will still be a feeling of disappointment with what could have been. We Seahawks fans have yet to enjoy a year where there hasn’t been some level of disappointment, and one would think that it would be something a person could become accustomed to. We will continue to hold onto the belief that next year will be our year. I can’t wait to see what Coach Carroll can do with this team next season and into the coming years. 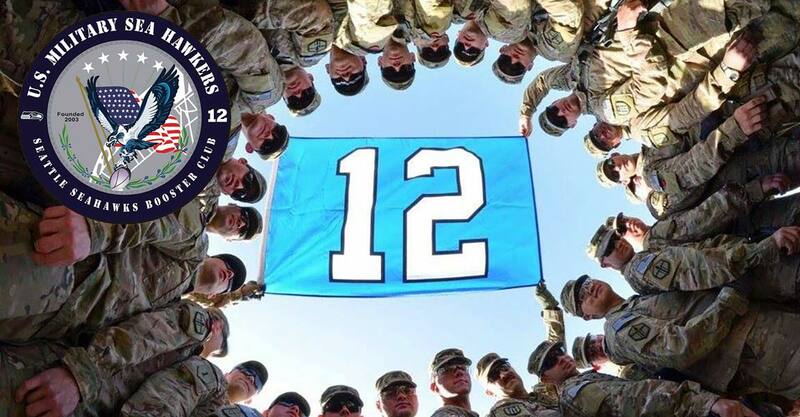 Thank you to the Seahawks, our Military Sea Hawkers and 12th Man for a great season.